The story of gin begins in the 16th century when gin’s first cousin, genever, became the national drink of the Dutch. This marriage of grain spirit, juniper berries, herbs and spices was well known in England from the 1640s onwards, due to the hundreds of mercenaries returning from long wars in the Low Countries where they had encountered the local brew as fiery grog given to steady nerves before battle. Dutch courage they called it. Then, however, the English, unlike their Celtic neighbours, were not generally spirits drinkers. Once Dutch King William arrived on the British throne in 1688, drinking habits changed dramatically. Genever, now known as gin, became the drink at court. The fashion for gin, alongside legislation to deregulate distilling and a ban on the import of anything French, created a domestic distilling industry. There followed the well-documented years of gin madness, especially in London where, in 1733, the city officially produced 11 million gallons of gin, 14 gallons for every resident – man, woman and child. In 1751 came the first effective legislation to tackle the gin epidemic. Over the next 50 years, increasing control and taxation drove out the back street boys leaving only reputable companies. These gentlemen distillers of London took advantage of the invention of the continuous still to make pure spirit in cost-effective quantities. Now, instead of disguising the flavour of rotgut alcohol with sugar and strong flavourings, the new type of spirit could be redistilled, or ‘rectified’ with subtle botanical flavourings to produce a clean, unsweetened, colourless drink known as London Dry Gin. From the 1850s onwards, the London Dry style came to define the category. It still does apart from a few exceptions, of which we’ll learn more later. Arguably the 1950s and the 1960s were gin’s heyday. This was a time when if you walked into any bar anywhere and ordered a martini, it would be made with gin. 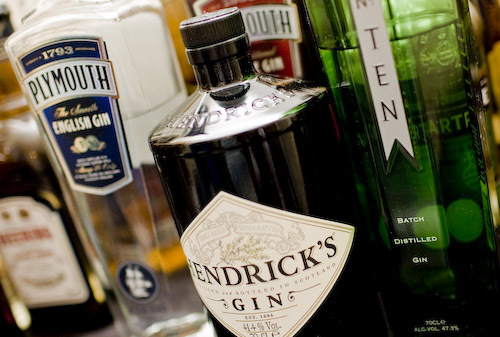 Approximately 50 per cent of any cocktail list would be made with gin. But all that ended with the growing dominance of vodka. By the 1970s, gin was almost stagnant in terms of growth. Even worse, it had lost its iconic image and was perceived as the opposite of cool. What was old is now new again and gin is once more the star of the cocktail scene. Its revival began in 1988 when Michel Roux, the creator of Absolut Vodka, developed a speciality premium gin called Bombay Sapphire. Stylish packaging and a less juniper-dominated taste profile attracted a younger audience. But perhaps the most significant achievement of the Bombay Sapphire phenomenon was that it proved it was possible to reinvent an entire category.